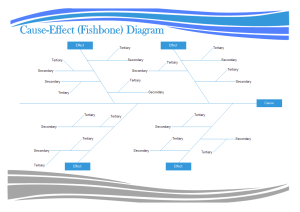 Creating fishbone diagram with free templates and examples. Fishbone diagram has never been easier. Fishbone diagrams (also called Ishikawa diagrams or cause-and-effect diagrams) show the causes of a specific event. Fishbone diagrams help you brainstorm within a well-defined structure in order to sort your ideas into useful categories. 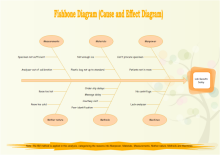 Moreover, the fishbone diagram identifies many possible and potential causes for an effect or problem. 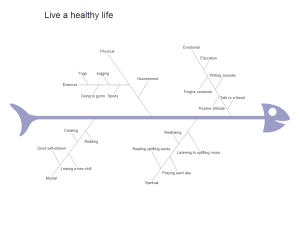 Edraw offers an easy way of creating fishbone diagrams to systematically review factors that affect or contribute to a given situation. Simply open a template and add shapes from the library. You can use a nice looking pre-defined theme with only one click, or customize through line, color and size settings. The software is also designed with a group of editing tools for resizing, rotating, grouping, order, align and distribute, which greatly simplify the drawing process. 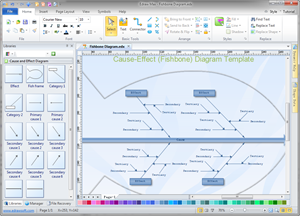 Cause and effect diagram templates contain many special shapes, effect, fish frame, category, primary cause, secondary cause, main frame. It is quite convenient to use these shapes to diagram your own cause and effect diagram. 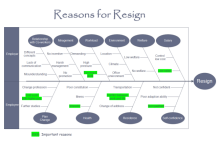 Go to using fishbone diagrams for cause analysis to learn more management skills. Have a look at this clear and neat fishbone example to get more ideas on fishbone design. You can also download and make full use of this customizable template. 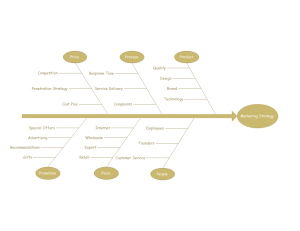 Another fishbone example is provided to facilitate our users in fishbone diagram designs. You will find it amazingly convenient to have this editable template. The character of this template is that some ideas are visualized by clipart. The crucial information is also highlighted. 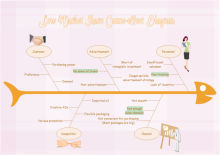 Refer to Customizing Your Cause and Effect Diagram for more related information. This is a featured fishbone diagram, elaborately designed and visually appealing.